With the final election night report in and 100 percent of county precincts reporting, the fates of most local ballot measures appear set and Measure K has pulled ahead in the final election night tally. Measure H, which would impose a 10 percent transient occupancy tax in Blue Lake, is passing in the final tally with 73.56 percent of the 348 votes counted thus far. Measure I, which would impose a 0.25 percent transaction and use tax to fund road repairs in Eureka, has taken 61.85 percent of the 5,049 ballots cast, a bit short of the 66 percent it needs to pass. It doesn’t look like it will get there, meaning the city may have to look elsewhere for the projected $2.2 million it was expected to take in annually to fix city roadways. Measure J, which would impose a 1 percent transaction and use tax in Rio Dell, is struggling, with 48.1 of the 578 votes counted thus far. Measure K, which would make Humboldt a “sanctuary” county, barring county employees from coordinating with U.S. Immigration and Customs Enforcement in almost all cases, has surged ahead, taking 51.56 percent of the 28,433 ballots counted. Measure L, which would approve the issuance of up to $4 million in bonds to fund facility and technology upgrades in the Cutten School District, has taken 66.39 percent of the 1,467 ballots tallied so far and seems poised to pass. It needs 55 percent to pass. Measure M, which would prohibit the city of Arcata from modifying, destructing or relocating the statue of President William McKinley in the Arcata Plaza, is going down, with just 37.84 percent supporting keeping McKinley where he is, with 3,919 ballots counted in the race when election night came to a close. Measure N, which would approve the issuance of up to $24 million in bonds to pay for facility upgrades in the Northern Humboldt Union High School District, is faring well in through the final batch of ballots, having taken 69.27 percent of the 10,152 votes tallied. It seems assured of getting the 55 percent of the vote needed to pass. Measure O, which would continue the countywide 0.5 percent sales tax to fund county services, seems poised to cruise to passage, having taken 71.94 percent of the vote through the final election night report, which includes 28,785 ballots. For full countywide final election night report, click here. With the third election night report, the fates of local ballot measures are beginning to come into focus. Measures K is coming on strong with late returns and is becoming a bit of a nail biter. Measure M, meanwhile, is going down in flames as the ballot tallies grow. Measure H, which would impose a 10 percent transient occupancy tax in Blue Lake, is passing in the early tally with 73.56 percent of the 348 votes counted thus far. Measure I, which would impose a 0.25 percent transaction and use tax to fund road repairs in Eureka, has taken 61.71 percent of the 4,732 ballots cast, a bit short of the 66 percent it needs to pass. Measure J, which would impose a 1 percent transaction and use tax in Rio Dell, is still struggling, though faring a bit better, with 48.1 of the 578 votes counted thus far. Measure K, which would make Humboldt a “sanctuary” county, barring county employees from coordinating with U.S. Immigration and Customs Enforcement in almost all cases, has taken 49.9 percent of the 24,658 ballots counted so far. Measure M, which would prohibit the city of Arcata from modifying, destructing or relocating the statue of President William McKinley in the Arcata Plaza, is going down, with just 40.62 percent supporting keeping McKinley where he is, with 2,885 ballots counted in the race thus far. Measure N, which would approve the issuance of up to $24 million in bonds to pay for facility upgrades in the Northern Humboldt Union High School District, is faring well in through the second batch of ballots, having taken 67.31 percent of the 7,477 votes tallied. It seems assured of getting the 55 percent of the vote needed to pass. Measure O, which would continue the countywide 0.5 percent sales tax to fund county services, seems poised to cruise to passage, having taken 71.16 percent of the vote through the third election night report, which includes 24,967 ballots. For full countywide third report election results, click here. With the second election night report out, the fates of local ballot measures are beginning to come into focus. Measures K and M continue to struggle, while Measure O looks like it has overwhelming support. Measure H, which would impose a 10 percent transient occupancy tax in Blue Lake, is passing in the early tally with 71.62 percent of the 148 votes counted thus far. Measure I, which would impose a 0.25 percent transaction and use tax to fund road repairs in Eureka, has taken 61.85 percent of the 4,204 ballots cast, a bit short of the 66 percent it needs to pass. Measure J, which would impose a 1 percent transaction and use tax in Rio Dell, is still struggling, with 45.45 percent of the 264 votes counted thus far. Measure K, which would make Humboldt a “sanctuary” county, barring county employees from coordinating with U.S. Immigration and Customs Enforcement in almost all cases, has taken 47.32 percent of the 17,315 ballots counted so far. Measure L, which would approve the issuance of up to $4 million in bonds to fund facility and technology upgrades in the Cutten School District, has taken 66.39 percent of the 1,467 ballots tallied so far. It needs 55 percent to pass. 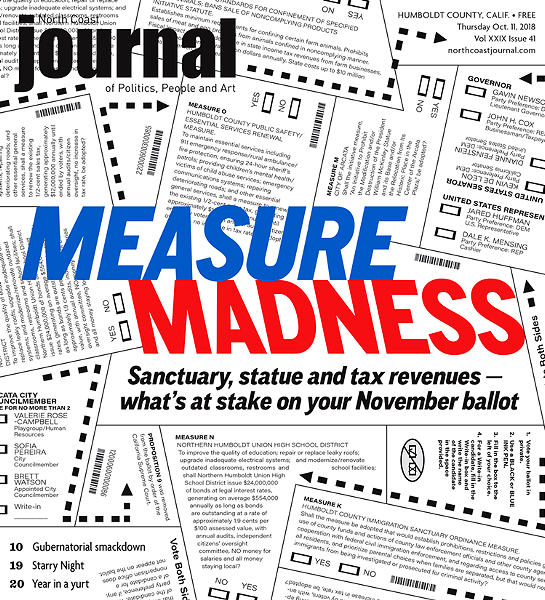 Measure M, which would prohibit the city of Arcata from modifying, destructing or relocating the statue of President William McKinley in the Arcata Plaza, hasn't moved since the first batch of ballots were counted, with just 49.04 percent supporting keeping McKinley where he is, with 1,348 ballots counted in the race thus far. Measure N, which would approve the issuance of up to $24 million in bonds to pay for facility upgrades in the Northern Humboldt Union High School District, is faring well in through the second batch of ballots, having taken 62.41 percent of the 3,802 votes tallied. It needs 55 percent to pass. Measure O, which would continue the countywide 0.5 percent sales tax to fund county services, seems poised to cruise to passage, having taken 69.98 percent of the vote through the second election night report, which includes 17,567 ballots. Humboldt County voters are deciding the fate of eight local ballot measures, ranging from school bonds to a countywide “sanctuary” ordinance. Measure H, which would impose a 10 percent transient occupancy tax in Blue Lake, is passing in the early tally with 71.62 percent of the vote. Measure I, which would impose a 0.25 percent transaction and use tax to fund road repairs in Eureka, has taken 59.28 percent of the early ballots cast, a bit short of the 66 percent it needs to pass. Measure J, which would impose a 1 percent transaction and use tax in Rio Dell, is struggling early, with 45.45 percent of the vote. Measure K, which would make Humboldt a “sanctuary” county, barring county employees from coordinating with U.S. Immigration and Customs Enforcement in almost all cases, has taken 45.22 percent of the first ballots counted. Measure L, which would approve the issuance of up to $4 million in bonds to fund facility and technology upgrades in the Cutten School District, has taken 60 percent of the first ballots tallied. It needs 55 percent to pass. Measure M, which would prohibit the city of Arcata from modifying, destructing or relocating the statue of President William McKinley in the Arcata Plaza, is struggling in the first batch of ballots counted, with just 49.04 percent supporting keeping McKinley where he is. Measure N, which would approve the issuance of up to $24 million in bonds to pay for facility upgrades in the Northern Humboldt Union High School District, is faring well in the first batch of ballots, having taken 62.41 percent of the vote. It needs 55 percent to pass. Measure O, which would continue the countywide 0.5 percent sales tax to fund county services, seems poised to cruise to passage, having taken 69.47 percent of the early tally.